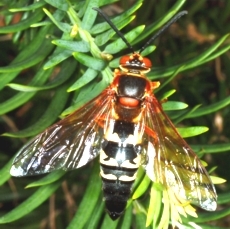 The cicada wasp is known by several different names including Giant Cicada killer, Cicada killer wasp and sand hornet. 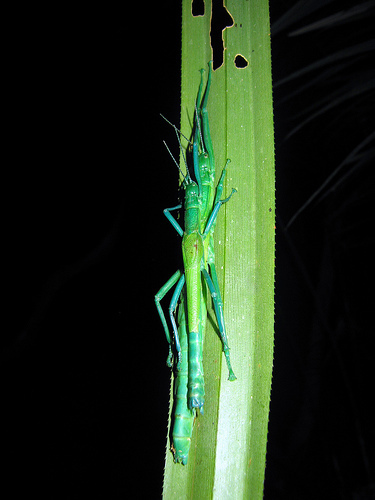 They measure 2 to 3 inches in length and appear in mid-summer, usually July and August. 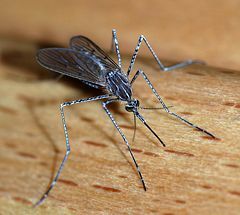 While they are fearsome in appearance, the male of the species has no sting but is quite territorial, and the female can sting but usually doesn’t she is a bit less aggressive and not very easily provoked. The adult Cicada Wasp has a black body marked with yellow lines on the thorax (the middle part) and the first few segments of the abdomin (rear part. The head and the upper part of the thorax is colored a rusty red along with the upper parts of the wings. The lower wingtips and the legs are a more yellow color and they may look much like a yellow jacket wasp. Cicada wasps are quite solitary as opposed to other wasp species such as hornets and yellow jackets. While the males have no sting, they are the ones who defend the nesting site aggressively while the female lays the eggs. These giant wasps can be seen in mid to late summer around lawns and trees and their size makes people naturally think that they are a danger to children and pets. They are often consider pest in gardens and lawns because after the female stings a cicada to paralyze it she will then dig a large hole in a garden or any loose soil to deposit the cicada in. 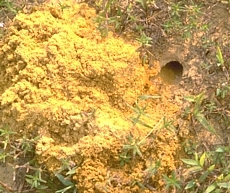 The burrow usually measure about 10 inches in depth and 1/2 to one inch in diameter. She will use her mouth to dislodge the dirt and then kick it away with her legs such as a dog might do. The female wasp may dig her burrow down and then dig again horizontally and place one or two cicadas in the end chamber with one egg. She continues this until there may be 10 to twenty individual chambers provisioned, she then lays her eggs and as the young hatch they feed on the cicadas. The eggs are usually laid in late July to early August and will hatch in 3 to 4 days. after another 4 to 10 days the larvae have matured and are ready to emerge. As adults, they feed only on nectar and different types of sap, they cicadas are only used to rear the young. A normal cicada wasp life cycle is 2 to 21/2 months, They emerge in July and rarely will be seen after mid September. We have many of these and they are veryscary but thanks to your information we no that the one we captures is a male and will not harm us. We really appreciate the information! I need help in identifying a flying wasp/hornet type insect. It was seen by myself today in Tucson, ARizona. I was watering plants and it came up a cement wall. It was HUGE. It was about 3-4 inches long, had the body shape of a wasp, probably about 3/4 inch across the lower part of the body and was solid dark brown. I was hoping to see a picture of the cicada wasp and maybe that was it, but this was SOLID DARK BROWN and huge. Can anyone help me? Sorry, cant really help, but it might hav been a hornet or type of wasp.